By clicking the pictures below, you can see what each facilities offers to you. From our open-air hot spa on the floor, you can enjoy the view of nature in Okushiga-kogen. In addition, the hot water, treated with the ore produced in Bad Gastein, Salzburg, Austria、the world-famous health spa resort, and the radium ore whose effects are accredited by MHLW, is body-friendly, and expected to improve blood circulation, increase metabolism, and strengthen self-healing power. The spa will give utmost comforts in bathing to everyone of all ages. On the fourth floor, large public bath with magnificent view adjoins the open-air hot spa. The entire front side of each bath is built with a glass panel with the full width and height so that you can fully enjoy the view while bathing from a different angle than that of the open-air hot spa. Babies who are not out of diapers are not allowed in our public bath with panoramic view. Thank you for your understanding. In each public bath, you will find sauna, one for men and the other for women. Our saunas have, again, large windows overlooking the beautiful landscape. You can refresh yourself in the cold bath after dripping plenty of sweat in sauna. There is a heated swimming pool on the basement floor for your activity on a bad-weather day. It is fitted with jacuzzi, and roomy sauna is adjoined, both for your relaxation after swimming. Babies who are not out of diapers are not allowed to use the swimming pool. Thank you for your understanding. 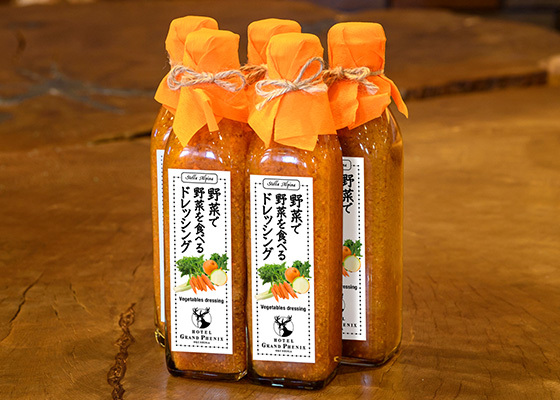 Our souvenir shop is offering you not only our original items such as the home-made salad-dressing, jam, and apple juice, but also north-Shinshu local goods such as Shigakogen beer,local souvenirs, and amenity goods, and looking forward to your shopping. but also on carpaccio, hamburg and other meals. 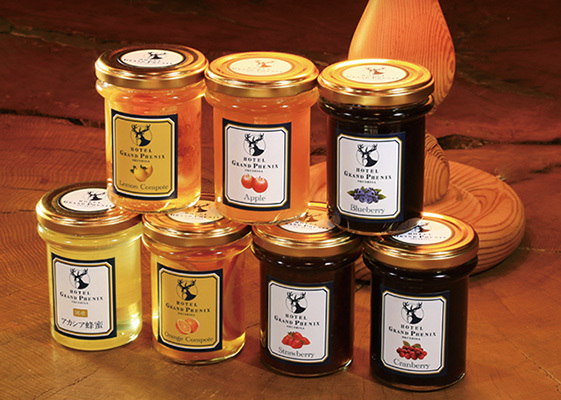 "Preserved-style", so as to preserve the best of original and natural flavor of the fruits. Prepared carefully using honey to bring the refreshing flavor, as with the jam. A hard-to-find item as collection amount of the honey is so scarce. *The above prices are all tax-included. 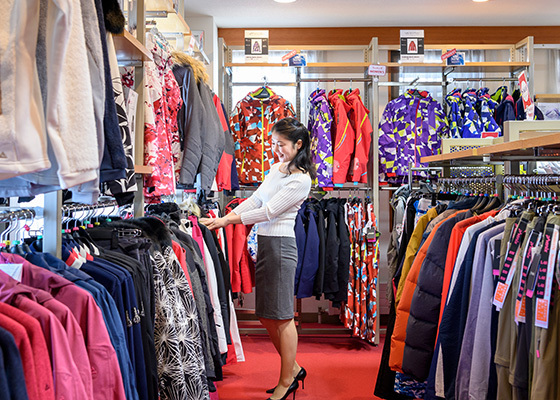 Our outlet shop, the only outlet shop in the entire Shigakogen area, offers a variety of sports wear starting from ski wear to outdoor wear. It also features children’s wear, “Copenhagen Delights” by Danish designer. The great reputation that you could immediately tell the difference on just putting on Grand Phenix's rental ski! where so-called rental ski models are often standard.As for ski waxing, meticulous work is guaranteed by our shop-staff. * Latest Ski model : A good stock of the latest and the-most talked about models among ski brands … Atomic ‒ Head ‒ Rossignol ‒ Ogasaka, etc., at our shop. * Ski style : Our ski rental shop is always ready to meet all types of skiing … from demonstration type to off-piste skiing. * Boots : Ski boots, which are treated in inner boots with high-tech rubber pad for shoe-sore prevention care, are available. Our ski locker room is designed and build on the basis of the skiers-first concept. The lockers are large enough to keep not only skis and boots, but other items like helmet and gloves.